Roderic “Ricky” Rama Poca was a journalist and educator. 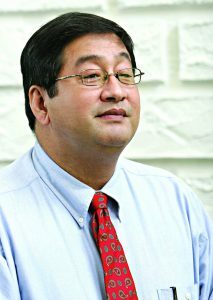 Roderic “Ricky” Rama Poca, 58, Cebu Daily News columnist and host of the weekly 888 News Forum at the Marco Polo Plaza Cebu, died of cardiac arrest today, Dec. 26, 2017. On dialysis for years, he had been due for a kidney transplant. Poca followed in the footsteps of two journalists in his clan—the late senator Vicente Rama, who founded Ang Bag-ong Kusog, and Napoleon Rama, former publisher of the Manila Bulletin. A law graduate of the Ateneo de Manila, Ricky juggled a media career with life in the academe. He was a former chairman of the political science department of the University of San Carlos. In 1995, Poca hosted the radio program “Pagpakabana” in dyLA and later, “Ang Isyu Karon” in dyRF. He also co-anchored “Hello Cebu: Maayong Buntag, Pinoy,” a public affairs program on CCTN Channel 47.